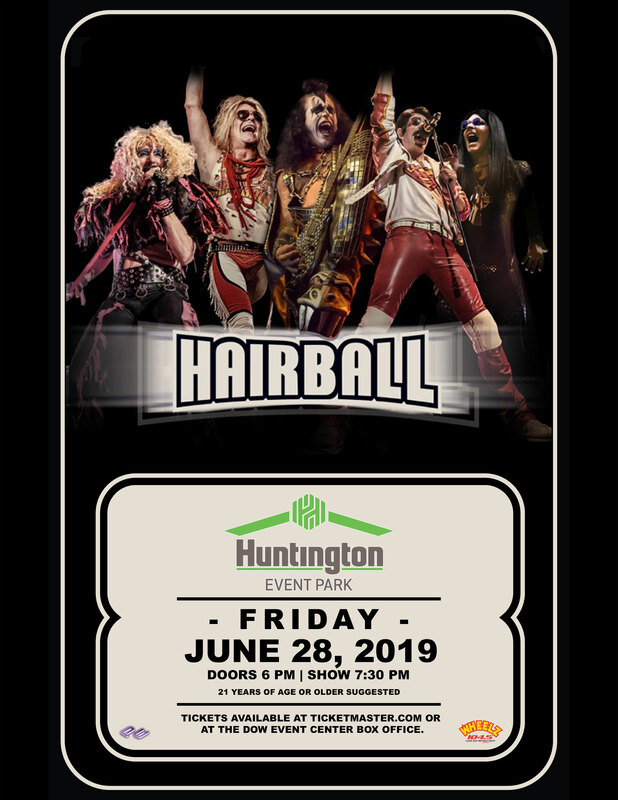 Friday, June 28, 2019 at 8:00 p.m.
A band puts on a concert – Hairball puts on an event! Hairball is a Rock & Roll experience you won’t soon forget. The lights, sound, fire, bombs, and screaming hoards of avid fans…to merely call it a concert would be like calling Mount Rushmore a roadside attraction! Vocalists, Joe, Kris and Bobby, lead the band through a 2+ hour, mind-blowing, and drop-dead accurate homage to some of the biggest arena acts in the world. Van Halen, KISS, Motley Crue, Queen, Journey and Aerosmith are but a few of the acts fans will see brought to life. The Hairball stage becomes an entirely new rock concert before your very eyes countless times throughout the night. The motor that drives the Hairball dragster consists of Freaky on the electric bass, Billy on the drums, and Happy on the lead guitar. These Rock & Roll soldiers pride themselves on nailing some of the most memorable licks and chops of all time, while adding their own style and flare that they’ve cultivated over decades of tireless performing. This isn’t a side job. These guys eat, sleep and breathe Rock & Roll! 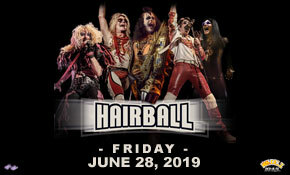 2019 finds Hairball celebrating its 18th year of rocking hundreds of thousands of people across the country. Constantly adding more characters, more pyrotechnics, more lights, more sound, more props, more surprises…more everything! While Happy often tells the audience “Today is the first day of the rest of your life!” Hairball performs every show as though it could be their last. Every night is 100% full-on, no-holds-barred, exciting, chaotic, fiery party that has to be experienced to be believed! As important to Hairball as the music, are its fans. While many bands claim to have the best fans in the world, Hairball actually has! Whether they are 10 years old or 100, Hairball fans bring an unparalleled enthusiasm and energy to the show that enhances the arena experience. Hairball knows it wouldn’t exist without its fans and takes every opportunity to let them know that. Whether it’s a pre-show meet and greet, hanging out at the merch booth, or chatting online, Hairball has a lot in common with its fans and its always a good time when they get together. Don’t confuse Hairball with the countless “80’s Tribute” bands across the country. Hairball is an experience, an attitude, and an expression of music that isn’t simply a retro flashback. It’s a way of life, and it’s not going anywhere soon! Venue Presale: Thursday, April 4, 2019 at 10:00 a.m. – 10:00 p.m.
Venue presale tickets will be available online only at Ticketmaster.com with the venue presale code. The venue presale code will be released via email to all venue subscribers at approximately 10:00 a.m. on Thursday, April 4th. If you do not subscribe to The Huntington Event Park & The Dow Event Center email newsletter and would like to receive the venue presale code, please sign up for our emails at https://bit.ly/2LC76Y2 by Wednesday, April 3rd at 11:59 p.m.
On Sale: Friday, April 5, 2019 at 10:00 a.m.
Tickets on sale to the general public will be available at Ticketmaster.com, Ticketmaster by phone 1-800-745-3000 or in person only at The Dow Event Center Box Office. *Additional fees may apply when purchased through Ticketmaster. Prices listed are when purchased in person at our box office. *Prices vary by location. Prices are subject to change based on supply and demand.